Nearly 10 percent of Polish Arabian horses examined in a major study in their home country were found to have some form of eye disease. The Warsaw University of Life Sciences study involved eye examinations of 615 Arabian horses at Polish breeding farms, which covered 15 percent of the Arabian population in Poland. Katarzyna Paschalis-Trela and her colleagues, writing in the journal BMC Veterinary Research, said it was widely accepted that eye diseases and related complications were a serious health problem worldwide for horses. They had a great impact on the quality of life and value of affected horses, as well as their athletic and show potential. Eye diseases often required long-lasting and expensive treatments, and particularly if vision-threatening, may lead to disruption of training and potential disqualification from competition due to ongoing therapies and impairment. The study team said it has been difficult to define the scale of the problem in Poland, where equine ophthalmology was a relatively new veterinary discipline, not to mention a lack of epidemiological data. The 615 Polish Arabians enrolled in the study, housed across three large breeding farms, each received an eye examination, and their medical history from the previous five years was analyzed. All horses used in the study were recorded in the Polish Arabian Stud book. The prevalence of ocular diseases was found to be 9.75%. Equine recurrent uveitis was found to be most common, affecting 5.5% of the horses (34 animals). Cataracts unrelated to equine recurrent uveitis were next, affecting 3.3% of the horses. The researchers found that 1.13% of the horses (seven animals) had eyes classed as non-visual, due to a range of conditions. Post-traumatic lesions affected 0.8% of the horses, and glaucoma affected 0.16% of the horses. Conjunctivitis was diagnosed in six cases, all secondary to other eye problems. 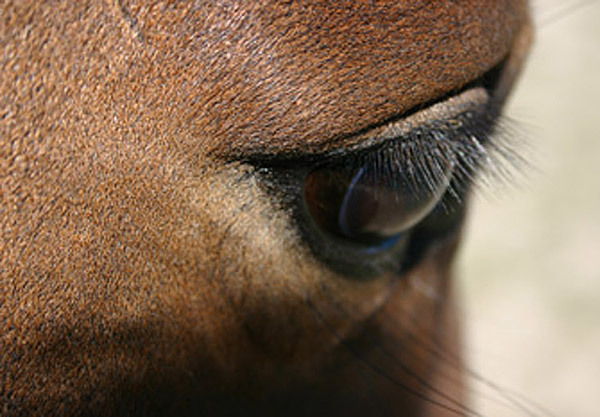 The prevalence of eye problems increased among older horses. The authors said the occurrence of eye lesions reported in this study, as well as the increasing prevalence seen in older horses, was consistent with most similar studies reported in horses. They said that while equine recurrent uveitis was the most common eye disease identified in Arabian horses in Poland, its prevalence was lower than levels usually reported in Europe and the United States. Eye conditions were an important clinical problem among the study population, they said. The study team comprised Paschalis-Trela, Anna Cywińska, Jan Trela, Michał Czopowicz, Jerzy Kita and Lucjan Witkowski. Katarzyna Paschalis-Trela, Anna Cywińska, Jan Trela, Michał Czopowicz, Jerzy Kita and Lucjan Witkowski. The study, published under a Creative Commons License, can he read here.